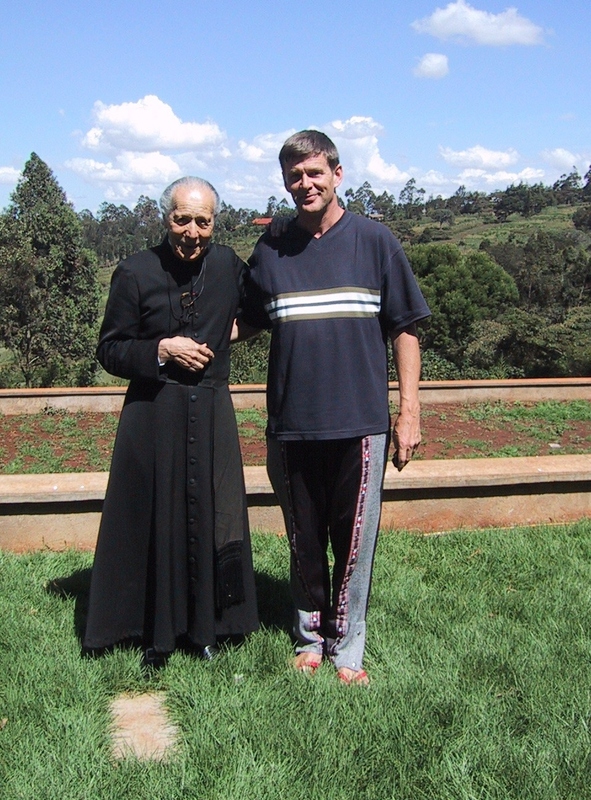 Fr Jean-Marie with Fr John Fortune in Ewuaso, Kenya, where Fr John is parish priest. Taken in 2002 during one of Fr Jean-Marie’s regular visits. I first met Father Charles-Roux 60 years ago when I was at Ratcliffe as a boy: he appeared to me to be a bird-of-paradise among a flock of sparrows. Later we were both together at Wadhurst Novitiate and finally here in Ely Place. I often served his Mass, and being the server of Father Charles-Roux gave one a glimpse into eternity, in more senses than one. When I was a boy, I was always puzzled by the Liturgy of Good Friday, where there was a prayer for the Holy Roman Emperor. The prayer remained even after Pius XII reformed the Easter liturgy in the 1950s, but the rubric said this prayer is omitted because the office of Holy Roman Emperor is currently vacant. What I utterly failed to grasp at that time was that this position had only become vacant just over twenty years before I was born. The office of Holy Roman Emperor was created in the year AD 800, when on Christmas Day the Pope crowned Charlemagne as the Christian Emperor of Western Europe, and for the next 1100 years his successors claimed to be Heirs to the Caesars. The world of Emperors, Czars and Kings was destroyed totally by the First World War. Jean-Marie Charles-Roux was born in Rome just after the outbreak of the First World War. This War destroyed much of what he was later to hold dear. This process in his mind began with the French Revolution, and left a scar in his imagination as one who believed, at least in part of his mercurial mind, in the Divine Right of Kings. Just months before he died, I visited Father Jean-Marie in his sister’s flat in Rome, which was filled with portraits of his formidable-looking ancestors, going back to his great-great-grandparents. These portraits must have looked down at Jean-Marie as a child. I was then shown a letter written by the four-year-old Jean-Marie to Father Christmas, dated December 1918. It was written in perfect English, requesting Father Christmas to send him a set of toy soldiers – to defend the Pope! There was a little shelf below the framed letter where a number of toy Swiss Guards had stood on duty for the last 96 years. The child is father to the man. To defend things ancient and sacred was deeply rooted in Jean-Marie’s psychology, and he lived to see the collapse of so much that he held dear. Twenty years later, the same Augustine lay dying on the floor of this same Cathedral in which the people of Hippo were seeking refuge from the Vandal horsemen who were laying siege to the city, having swept through Spain and across the sea to Africa. Soon Hippo would be no more. The Cathedral would be destroyed, but the reality behind the Alpha and the Omega inscribed on the floor of the Cathedral where he lay dying is eternal. That reality was far greater to Father Jean-Marie than his political opinions. ‘I will go to the altar of God who gives joy to my youth’ (Ps. 42). These words (Introibo ad altare Dei, ad Deum qui lætificat iuventutem meam) were said every day by Father Jean-Marie as he celebrated Mass. Father Jean-Marie remained young in spirit even in his hundredth year. When he retired from St Etheldreda’s in 1998, he went to Rome, allegedly to die, but he said he was unable to do so as Rome is the Eternal City. He went to live in the Rosminian house at Porta Latina, where the community is composed largely of students from the emerging non-European Church. Newman said: ‘Change is a sign of life: to change often is to be perfect’, and Father Jean-Marie was capable of great change even in the last decade of his long life. There, in this new community in Rome, he formed a friendship with Father John Fortune who is the main celebrant this evening. Father Jean-Marie had repeatedly asked Father John to be the celebrant at his funeral. Because of his missionary commitments in Africa, Father John was unable to travel to Rome in time for the funeral. We are delighted that he has come here today to celebrate Father Jean-Marie’s Memorial Mass. For many years, when he was in his nineties, Father Jean-Marie would fly to Nairobi to celebrate the Easter Liturgy with his African brethren. He said he had never appreciated the wonder of the Holy Week liturgy so profoundly as he did on the soil of Africa when the liturgy was celebrated in Kiswahili and English. On Good Friday, he walked the Stations of the Cross in the burning sun. During the Masses he knelt throughout in the tropical heat. Father Jean-Marie had been born into a Euro-centric world. He may have believed, with Belloc, that ‘Europe is the Faith, and the Faith is Europe’, but by the time of his death he had come to realise how much other cultures and traditions can add to the growth of God’s Kingdom. MC again knocks on the door three times. MC: A mortal and sinful man. If the Holy Roman Emperors in their own funeral liturgy stripped themselves of all earthly pretensions, it was because they appreciated the message of St Augustine that only the City of God is eternal. We pray for Father Jean-Marie Charles-Roux that he may now enjoy his heavenly citizenship. May he even rejoice in the company of the French Royal Family (including Queen Marie Antoinette) and the Holy Roman Emperors, knowing that they, along with the rest of us, were only mortal and simple beings redeemed by the Blood of Christ.